My name is Bryan, I am 15 years old. I have been playing piano since I was 3, and on my 3rd birthday, my grandparents bought me my first piano. It is a Wurlitzer Console piano that was made in 1972. When the piano was purchased, we owned a smaller house with limited space available so my grandparents bought me a small piano. Recently, I moved into a new house and much more space has become available. 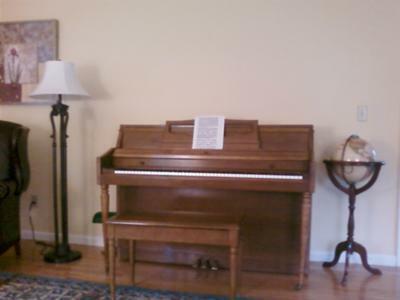 The living room looks awkward with a tiny piano up against the wall, so I'm looking to sell the Wurlitzer and purchase a baby grand. Specs: 41 inches tall, not sure what kind of wood (see picture), in perfect tune, a few tiny dents from years of kids in the house (you have to be in certain light to see them), keys in perfect condition. The bench is in acceptable condition, I'm only saying this because one of the hinges that holds it up while it's being opened is broken. It can be propped pretty easily without the hinge, though, so it shouldn't really be a problem. Other than that, the piano is in great condition. It's been in an air conditioned/heated house since it was bought. All of the pedals work, there isn't any wear to the inside, it's in perfect tune. Thanks for looking! The piano looks like you have taken really good care of it. I am not able to assess the value of pianos, especially small ones, but I can tell you that the best way to sell it will be to find a family with a child just beginning to study piano. These console pianos are perfect for beginners. If you advertise it that way, you will get more prospective buyers. I think that you might want to start at around $900 and see what happens. You can always go down if you need to. Best Wishes for your Piano life!